Pangu Pati has moved only seven MPs from the 10 it has on record, according to the official registry of political parties. 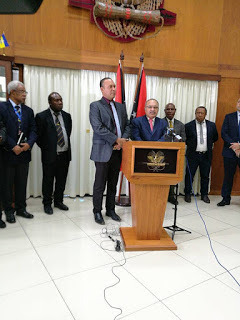 Along with it on Monday’s announcement were four pro Pangu independents Robert Agarobe (Central), Lekwa Gure (Rigo), Henry Amuli (Sohe), John Rosso (Lae), and THE party member turned Pangu member Lufa MP Moriape Kavori. The Registrar for Political Parties Dr Alphonse Gelu said the movements by independents who have aligned to Pangu are yet to be officially lodged to the registry. Dr Gelu said however, that it was just according to the registry’s official record and does not stop any movement occurring by MPs that have already occurred. He said independent movements registered so far have only been lodged by the ruling party People’s National Congress. “We only received the four (independents) that have moved to PNC and they have formalised that, but the other political parties not as yet,” Dr Gelu said. Dr Gelu said officially those who had moved with Pangu are still considered independents as far as the Organic Law on the Integrity of Political Parties and Candidates was concerned. Monday’s move by Pangu and pro-Pangu independents reduces the number of MPs in the Opposition ranks of 46 MPs in the Alliance coalition, the biggest opposition ever assemble in the past four terms of parliament. Meanwhile, the registry of Political Parties says the decision made by Pangu is the prerogative of the party and its leadership. Dr Gelu said each MP has the prerogative as to where they want to move to, with the registry only involved as far as recognised party listings. “That is Pangu’s decision, the Registry has no say, not only Pangu but any other party, when they want to move that is their decision to make,” Dr Gelu said. “Here at the registry we have nothing to do with that. When asked about what happens to those members of Pangu or affiliates that remained with the Opposition, Gelu said it also remains an internal matter for the individuals involved and the party to sort out as well. “It is up to the party and the MPs individually. The only time we come into play is when they inform us of their decision that is when we will change the listing,” Dr Gelu said.